Super-popular Windsor band, Michou, announced on Twitter today that they will be playing a major show right here in Windsor with legendary Canadian rock act, The Trews. The Michou-Trews show is part of the new “Summerfest Uptown”, to be held at the old Windsor Armouries downtown between June 23rd and 27th. Canadian singer/songwriter Serena Ryder will also entertain at the Armouries. She’ll be joined by Sultans of String, Junior Walkers All Star Band and So You think you can Dance Canada finalists Melanie May and Cody Bonnell. You can grab tickets through the TekSavvy Box Office. Michou/Trews tickets are only $11.50, hurry, they will go very fast. Then, this fall, Canadian pop-rockers Hedley will take the main stage at the WFCU Centre, the east end venue announced today. (Windsor, ON) Multi-platinum power pop-rockers, HEDLEY have just announced that they will extend their massively successful cross-Canada arena tour which saw them play 20 markets, with another run of dates this fall! Tickets go on sale for their Saturday Septmber 25th show at the WFCU Centre on Saturday May 29th at 10am online at www.wfcu-centre.com, by phone at 1-866-969-WFCU (9328) or in person at the TekSavvy.com Box Office inside the WFCU Centre. VIP packages on sale May 26th at 11am EST at hedleyvip.com. Hedley released their third studio album, The Show Must Go (Universal Music Canada) in November 2009 (currently Certified Double Platinum) and are enjoying the success of three hit singles; “Cha-Ching” and “Don’t Talk to Strangers,” both certified double-platinum on iTunes, and their current single “Perfect,” which peaked at #1 at MuchMusic and is approaching #1 at radio. 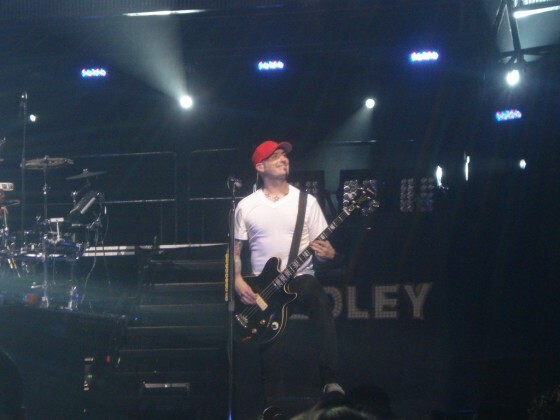 The Show Must Go is the band’s most successful album to date, which is no small feat as Hedley’s previous albums, Famous Last Words (2007) and Hedley (2005) both attained double platinum selling status. The band have just earned a whopping 5 MuchMusic Video Award nominations for the upcoming 2010 Awards, including Video of the Year, Best Pop Video and UR Fav Video.